There are studies suggesting that fiberglass particles can be linked to respiratory problems and cause (temporarily) skin irritation. More significantly, according to the Canada Mortgage and Housing Corp., there may be a potential cancer risk from exposure to both fiberglass and mineral wool insulation particles. Therefore, when handling any type of insulation always wear long sleeved tops, gloves, eye protection and a face mask. Having the work area well ventilated is also recommended. R-Value: R 2.9 per inch on average. Loose-fill fiberglass insulation is made from molten glass that is spun or blown into fibers. Most manufacturers use 20%30% recycled glass content. 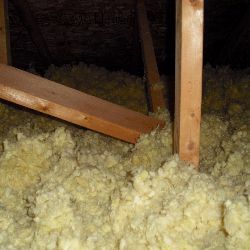 Loose-fill insulation must be applied using an insulation blowing machine; it is designed for open-blow applications (attic spaces) or closed-cavity applications (such as those found inside walls or covered attic floors). Loose-fill fiberglass insulation is sometimes used for retrofitting old homes by blowing the insulation into holes drilled into the tops of the walls. However, in my opinion, that is not such a good idea because the insulation may 'get stuck' on electrical wiring, firestops or plaster keys resulting in cavities with little or no insulation. It is ideal for attic insulation as it will fill irregular spaces between framing members, electrical outlets for ceiling lights and around other ceiling penetrations such as plumbing stacks, exhaust vents and chimneys. It is ideal for hard to reach places where it would be difficult or impossible to install other types of insulation.